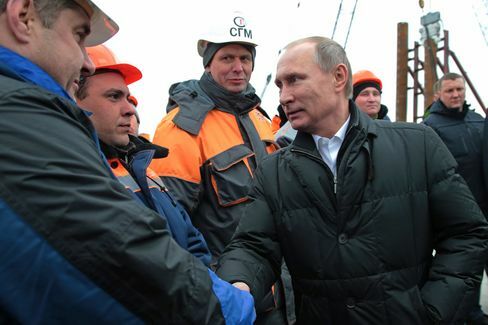 Vladimir Putin meets with construction workers on the construction site of a bridge across the Strait of Kerch, on March 18. The Russian government plans to build a bridge linking mainland Russia to Crimea. President Vladimir Putin said he wants to identify an official who can be hanged if a road leading to a new bridge that will link Crimea to Russia isn’t built, as he complained that nobody wants to take charge of the project. “There should be a specific person who can be hanged if it’s not done,” Putin said during a visit to Crimea to view construction work on Friday, the second anniversary of Russia’s annexation of the peninsula from Ukraine. Officials keep passing responsibility for the work to colleagues in different ministries, he said. The president’s comments were figurative, the Kremlin’s press service said later. Putin criticized officials after being informed about troubles building the road linking the bridge with Crimea’s capital, Simferopol. “A specific entity, a specific person responsible for the whole project is needed, so i wouldn’t have to call all government phones or regions,” Putin said after viewing work on the bridge. The road will lead to a 19-kilometer (12 miles) bridge planned to end the peninsula’s isolation. Construction of the span is a “historical mission” for Russia that must be completed by Dec. 18, 2018, Putin said. Linking Crimea to Russia across the Kerch Strait, it will boost economic growth, he said. Putin annexed Crimea in March 2014 after the peninsula approved joining Russia in a referendum branded illegal by the U.S. and the European Union, which imposed sanctions. The vote took place after masked, armed men seized the parliament and government buildings in Simferopol following the overthrow of Ukrainian President Viktor Yanukovych in February. Putin at first denied sending troops to Crimea, then later admitted that Russian servicemen had assisted local self-defense units. The Crimean peninsula is connected to Ukraine and has no land link to Russia. It was conquered by Russian Empress Catherine the Great in the 18th century and became part of Ukraine only in 1954 -- a gift of then-Soviet leader Nikita Khrushchev. Ukraine has vowed to reclaim Crimea. French President Francois Hollande and German Chancellor Angela Merkel “reaffirmed that the EU does not recognize the occupation of Crimea by Russia,” at talks Thursday in Brussels with President Petro Poroshenko, according to the Ukrainian presidential website. Crimeans’ decision to join Russia should be respected and the peninsula’s status can’t “be the subject of any negotiations,” Kremlin spokesman Dmitry Peskov told reporters on a conference call Friday. Russia’s “illegal invasion” of Crimea won’t be accepted “under any circumstance and Moscow eventually has to end its occupation of Ukraine’s sovereign territory,” U.S. Vice President Joe Biden said on a visit to the Ukrainian capital, Kiev, in December.